This procedure has been shown to greatly improve appearance and increase your chances for successful implants. Deformities in the upper or lower jaw can leave you with inadequate bone in which to place dental implants. These types of defects may have been caused by periodontal disease, previous extractions many years ago, trauma or developmental. This creates problems for placing implants, and also causes an unattractive indentation in the jaw line. 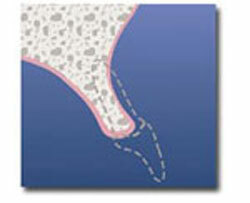 To correct the problem the gum is lifted away from the ridge to expose the bony defect. 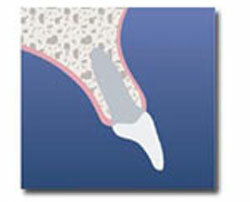 The defect is then filled with bone or bone substitute to build up the ridge. Finally, the incision is closed and healing is allowed to take place from 3-12 months; afterwhich, the implants are placed. Sometimes, the implants can be placed at the same time the ridge is modified. Ridge modification has been shown to greatly improve appearance and increase your chances for successful implants that can last years to come.